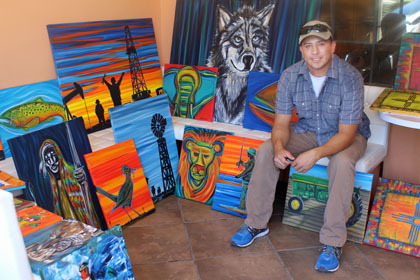 Above, Oscar Hernandez sits with his pop-up exhibit of Southwest-inspired canvas paintings Saturday afternoon at Yum Yum Yogurt during Artesia MainStreet’s ARTesia Art Walk. Artists from throughout the area were able to display their creations inside local businesses, while shoppers were given the opportunity to complete their Mother’s Day shopping as well as view and purchase a variety of artworks. 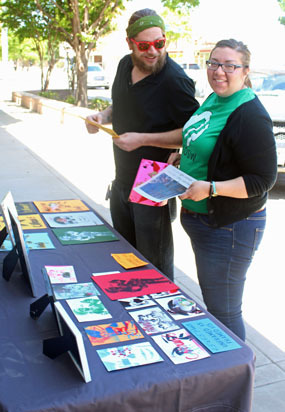 At right, Matthew and Maria Landrie set up their display of paintings and prints on the sidewalk in front of Kouros & Kore Saturday.